Everybody loves graduation day, that one day you finally achieve the milestone you have been working so hard for. With all of the hard work that goes into graduation, why not treat yourself to something fun, relaxing, and cool? With San Antonio Top Limo, you can do just that. Experience your graduation in class and style with one of our sleek limousines. Celebrate your graduation in luxury. Let us pick you up and do the driving while you sit back and relax. Our professional chauffeurs will be sure to get you to graduation on time. After that, it’s time to get the party started. Book your limo for your graduate today! Graduation is something that nobody will forget. Make it even more memorable with a luxurious limo ride to and from anything graduation related. No matter if it’s high school, college, a PhD or a Master’s, everything deserves an amazing celebration. With our selection of sleek stretched sedan limos, or our muscular SUV limousines, you can choose your pick of what you want to ride up in. Make all of the other graduates jealous when you step out of our luxurious limousine. You deserve every bit of luxury for your accomplishments. Make it easy for everyone to get to graduation as well. No need for the mass amount of cars from all of your friends and relatives going. Just hop into one of our limousines, and we can take care of that part for you. Enjoy some great music from our surround sound speaker system, relax in the back and have a cold beverage while you wait. You’ve worked hard every day for this accomplishment, and you deserve a good treat. San Antonio Top Limo offers all types of limousines. Choices range from stretched sedans, to SUV limos, and all the way up to our massive Texas-sized 22 passenger Hummer limousine. You’re sure to catch attention in any of our limousines, but our biggest one is obviously the biggest eye catcher. 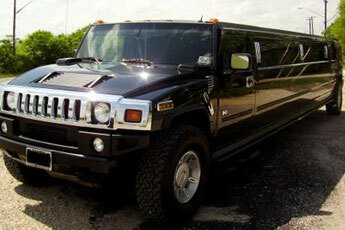 With space for up to 22 passengers, this stretched Texas-sized Hummer is the biggest limo in our fleet. The sleek jet-black paint job does the job when it comes to style, and the interior is just as luxurious. With its surround sound speaker system, flat screen TV, wet bar and awesome LED lighting system, you’ll be sure to impress all of your friends and relatives with this bad boy. When you arrive, our professional driver will let you out to your grand celebration. And after the graduation is complete, it’s time to hit the town for even more partying. Graduating takes a lot of work after all, so take a break from all of that and just have a fantastic time wherever you choose to go afterwards. And whatever you decide to do, we can get you there. Just give us a call, and we can set you up with one of our amazing, luxurious limousines today. You deserve it.